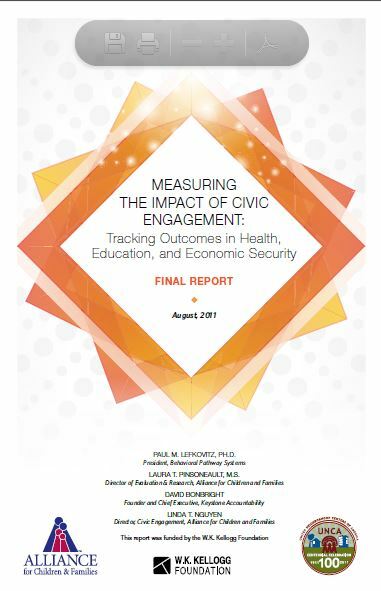 This report provides an overview of a process to develop tools to measure the impact of civic engagement practices in human services. The Civic Engagement Measurements System (CEMS) is an inter-related set of tools that are believed to represent a promising new approach to the measurement of outcomes and impacts of civic engagement. First started in 2006 as a searchable, browseable website set up to collect and share the social sector’s knowledge, IssueLab became a service of Foundation Center in 2012. Since then, IssueLab’s mission has grown beyond the “simple” collection and distribution of knowledge products, to include the support of social sector organizations in adopting the practical and necessary steps to openly publishing what they fund and produce. Foundation Center‘s mission is to connect nonprofits and funders to the knowledge they need to do their jobs better and to deepen the impact of their efforts. Through IssueLab we support ongoing learning and research in the social sector, believing in the power of the sector’s collective intelligence and the importance of open and free access to that intelligence.